Long before I began writing for the public to view, I was requested to write an informative piece on the detriments of the ever popular “shake” trend. Naturally, my bias is clear, as I am versed in plant-based nutrition that focuses exclusively on whole foods. My view on certain dietary trends and lifestyles has been variable, relating to conclusive research that disproves that “one diet fits all” and that if one is eating one way now, it may not be the “right way” later, but overall my focus on whole foods has never subsided. As much as I love the idea of a “quick fix” I can safely assume that most of us have been aware of, if not approached by, the multi-level-marketing (MLM) companies out there that boast a variety of life changing products. Some of these companies even go as far as calling their sales associates “health coaches” with little to no formal training or education in nutrition or dietetics—this is worrisome. While I strongly advocate the promotion of eating healthy and following a regimen that works for a particular individual, these blanket assumptions that “one shake fits all” are not only unsustainable, they may be dangerous–not to mention expensive. Here’s why. 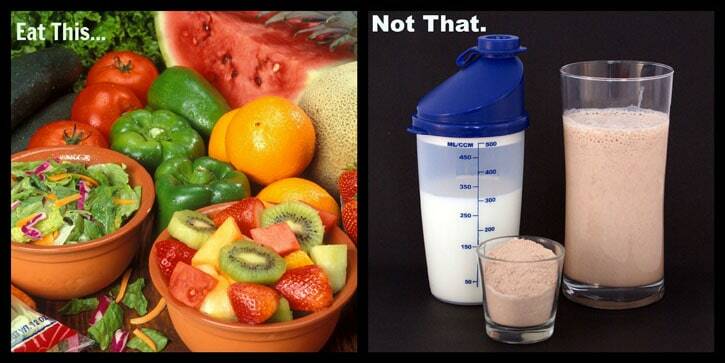 Our bodies are not physiologically adapted to replace whole foods with powders, bars, and energy supplements. While we may think there are no obvious issues from these supplements, there are no scientific studies that have observed people taking these supplements for a long period of time, and for good reason. Firstly, it would become apparent that long-term ingestion of these products is not helpful, but harmful. Secondly, there are very few people in this world who will continue to use these supplements throughout their entire lives–it’s just not realistic. Ingredients like artificial preservatives, sugar substitutes, dairy derivatives, artificial flavors, soy, and oils high in Omega 6 fatty acids are just a few of the reasons why we need to say “no!” to such products and run–quickly. “But Kate, thousands of people have lost weight with this program–it must be effective! ?” many people have asked. Here’s the reality: if you replace the standard American diet with any type of low-calorie program, weight loss will incur. But skinny does not necessarily equal healthy and there is a much more effective, beneficial, healthy, cost effective and lasting way to not only lose weight, but clear up hormonal imbalances, blood sugar issues, skin disorders, and a damaged metabolism. And it’s quite simple. This doesn’t mean that we all need to become fanatical vegans; it just means that we should steer our focus toward foods that are nutrient-dense, such as green vegetables, root vegetables, low-glycemic fruits like berries and apples, whole grains (if your digestion can tolerate them), and organic, farm-raised, or wild-caught meats and fish. Replace sugar with coconut palm sugar, stevia, honey, or maple syrup and avoid sugar substitutes like sucrose and aspartame. And if you just can’t stand to eat that much vegetation–juice or blend your greens with some apple and lemon and drink up! You will inevitably notice a difference in your appearance and energy levels. Are there some healthy whole food supplements out there? Yes, and if that’s what you are dead set on, then go for it, but keep in mind that we are much more likely to assimilate the nutrients in an apple than an apple-flavored protein shake.